Designed to survive the influx of zombies, this piece is also great for hunting, home defense and camping use. It's gigantic 10 3/4 in. 440 stainless steel blade is finished in black and features a blood grove down its entire length. The full-tang strength feels great in your hand underneath the over-molded rubber grip and stainless hand guard. Includes black leather belt sheath with snap closure. 16 3/4 in. overall. 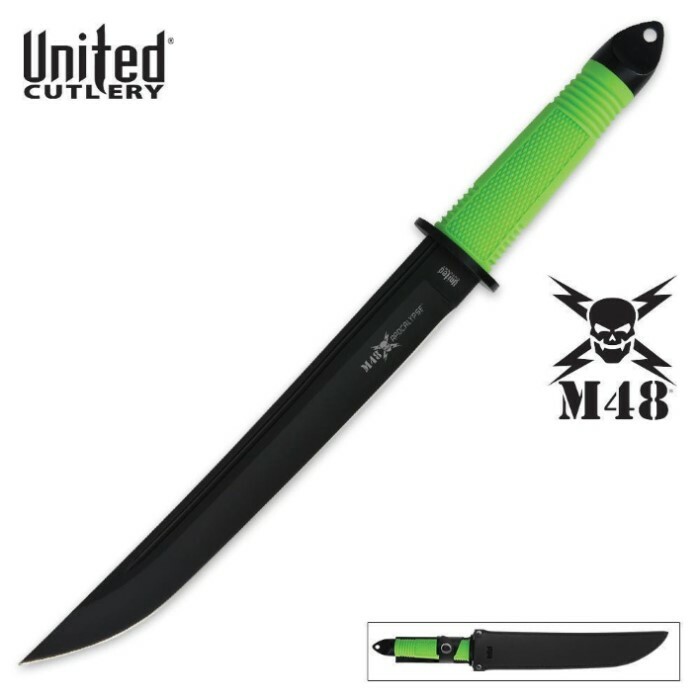 Please note: While this knife is the same as our "Honshu Tanto Knife - Close Quarters Combat - Black Edition", it was made with Zombie Apocalypse colors, and was not produced under the Honshu brand name. First of all, this is a Honshu/M48 creation. The tanto comes in a Honshu box and is the same design as the other Honshu tantos sold on BUDK, but it is under the M48 Apocalypse series. This thing is wicked sharp and just feels dangerous when I hold it. The sheath is heavy duty leather. I have to say that this United Cutlery blade is worth every penny.